Three decades after the then elite class Shatabdi Express made it on Indian tracks in 1988 much to the delight of railway passengers, the train will gradually be replaced by an ultra modern train equipped with sophisticated interiors, digital platforms and onboard Wi-Fi services. Named Train 18, the first of the lot will be launched by this month end. When India’s first Shatabdi Express was introduced it made a revolution in inter-city travel in terms of speed and comfort. Now a new set of self-propelled train (like metro coaches) made indigenously at the Integral Coach Factory (ICF), Chennai, will be hitting the tracks on October 29. Sources said the route for the introduction of the first pair of trains will be selected by the PMO and the choice could likely be between Patna-Lucknow and Varanasi-Patna, as this would cover both the politically sensitive States of Uttar Pradesh and Bihar. “Train 18 will be able to attain speeds of 160 kmph which means travel time will come down by at least 15 per cent compared to Shatabdi. The new technology will also save around 20 per cent in terms of life cycle cost and will require less maintenance as compared to Shatabdi. The weight of Train 18 is also considerably less since no locomotives or power cars are required. The net energy required is less,” said S Mani, General Manager Integral Coach Factory. The first stainless steel-made train set will have 16 chair-car type air-conditioned coaches — 2 executive and 14 non-executive — with a maximum seat capacity of executive chair cars at 56 passengers. The capacity of the non-executive class will be 78. 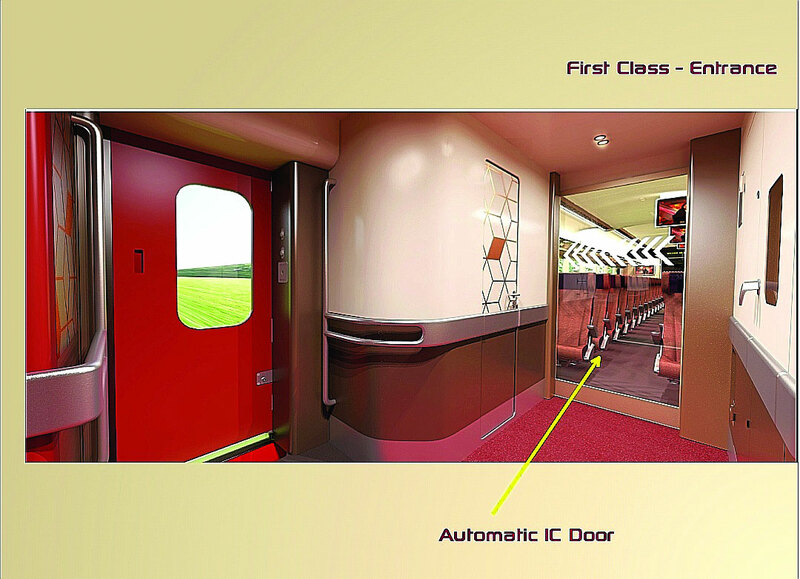 The most interesting feature of Train 18 would be its automatic doors and footsteps. The modular toilets will have aesthetic touch-free bathroom fittings. They have zero discharge bio vacuum toilets. The luggage rack of Train 18 will be more spacious so that passengers can carry more luggage. Just like the metro trains or the EMUs, Train 18 will have driver’s cabin at both ends of the train. The coaches of the self-propelled train set will be inter-connected and they will also have space for wheel-chairs for disabled passengers. Train 18 will have the latest generation coaches for greater comfort with several new features, including reduced aerodynamic drag for improved energy efficiency, improved air ducting for better distribution and underslung propulsion. It will have quick acceleration and deceleration, thus reducing the travel duration. While there will be on-board Wi-Fi and infotainment, GPS-based information system will enable passengers to know the real-time movement of the train. The initial idea to replace Shatabdi Express between Delhi and Bhopal by Train 18 has been dropped due to the model code of conduct coming into effect for the Assembly elections in Madhya Pradesh. The new train set is also likely to be cost-effective for the national transporter as it would cost around Rs 5-6 crore per coach.